The Ohio Physician Wellness Coalition (OPWC) was established last year to address physician burnout. Last week, the OPWC—which represents physicians and hospitals statewide—launched www.ohiophysicianwellness.org, a website with a large collection of resources and tools to tackle this often hidden, but very real, problem. According to the Mayo Clinic, burnout affects physicians at all levels of training and at various stages of their careers: 28-45% of medical students; 27-75% of residents; and about 37% of attending physicians. A recent study also concluded that physicians are spending 49% of their time on administrative tasks and only 27% with their patients. Physicians are facing myriad problems that have led to burnout and even suicide, such as ever-increasing regulatory demands, loss of autonomy, decreased reimbursement, and a physician shortage within the next decade. OPWC members agree there clearly is a need for change—to change physicians’ workload and the environment in which they practice medicine. Jaividhya Dasarathy, MD, the Ohio Academy of Family Physicians representative and member of the OPWC Physician Advisory Council, said a multifaceted approach is necessary to address burnout. 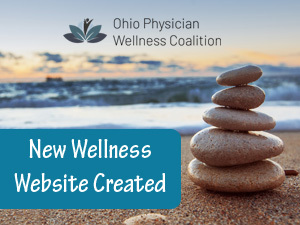 “OPWC is working to create a healthier Ohio physician community and one way to tackle that is to bring all of the many wellness resources together on one website. It is OPWC’s hope to provide tools and programming like this that address physician burnout and provide solutions to improve physician well-being for all aspects of the physician’s life,” Dr. Dasarathy continued. Additional initiatives to address this important issue are currently under review by the OPWC Physician Advisory Council. To address regulatory issues, OPWC has partnered with the Medical Association Coalition (MAC), a group dedicated to monitoring legislation and agency rules that impact physicians, their practice, and their patients. More information on the MAC is available on the OPWC website. Members of the OPWC include the Ohio State Medical Association; the Ohio Osteopathic Association; the Ohio Hospital Association; the Academy of Medicine of Cleveland and Northern Ohio; the OAFP; the Ohio Psychiatric Physicians Association; the Ohio Chapter, American College of Emergency Physicians; the Ohio Chapter, American Academy of Pediatrics; the Columbus Medical Association; and the Ohio Physicians Health Program. If you have questions about the OPWC, please email Kaitlin McGuffie or call 800.742.7327.